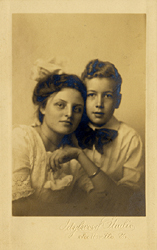 Susie Blair and Andrew Gilbert Bell, Jr.
Name: Susie Blair and Andrew Gilbert Bell, Jr. Comments: Susie Blair was born in 1896 and was the daughter of Dr. Joseph P. and Susie (Powers) Blair and granddaughter of Dr. and Mrs. Pinckney Powers of Scottsville. She graduated from Scottsville Schools and Hollins College where she studied drama. Susie served as a board member for the Scottsville Museum for many years. Andrew Gilbert Bell, Jr., was born on June 9, 1902, and was the son of Andrew Gilbert Bell, Sr., and Annie (Powers) Bell of Scottsville and the cousin of Susie Blair. 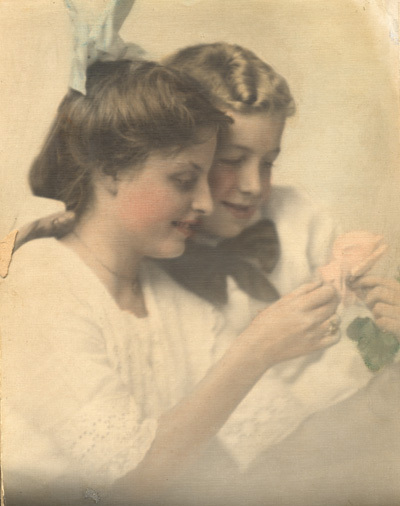 At right is another photo of these two cousins, taken by Burgess during the same portrait session.